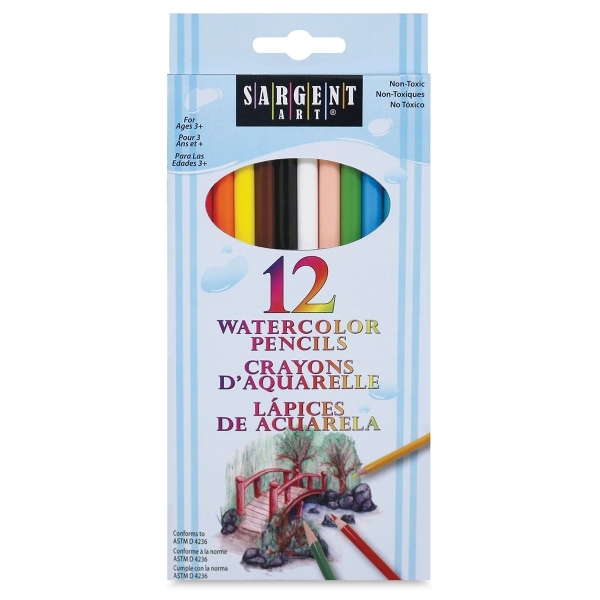 These exceptional watercolor pencils are priced for the beginner, but have the high quality that professionals look for. They can be used to create a variety of special effects with the addition of water. Constructed from the finest pigment for consistent coverage, and premium wood for easy sharpening. Pencils are pre-sharpened. Classpack of 240 — Includes 20 each of 12 colors, including Red, Brown, Green, Blue, Yellow‑Green, Magenta, Yellow, Orange, White, Light Blue, Light Violet, and Black. 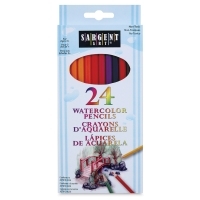 Set of 24 — Includes colors in the set of 12, plus Peach, Red-Orange, Maroon, Red-Violet, Blue-Violet, Sapphire Blue, Evergreen, Blue-Gray, Gray, Aquamarine, Light Orange, and Yellow-Orange. 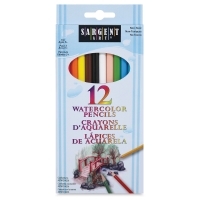 Set of 12 — Includes Red, Brown, Green, Blue, Yellow-Green, Magenta, Yellow, Orange, White, Light Blue, Light Violet, and Black. 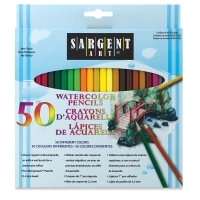 Set of 50 — Includes White, Black, Rose, Brown, Light Blue, Blue, Violet, Orange, Yellow, Light Green, Golden Yellow, Dark Violet, Pink, Yellow Green, Gray, Cream, Magenta, Red Orange, Tan, Daisy Yellow, Light Yellow, Lemon Yellow, Salmon, Burnt Orange, Mahogany, Red Violet, Burgundy, Aqua Green, Green, Burnt Sienna, Maize, Grass Green, Forest Green, Navy Blue, Ocean Blue, Green Grey, Blue Violet, Blue Green, Apple Green, Blue Grey, Dark Green, Red, Dark Lavender, Peach, Dark Brown, Dark Blue, Deep Purple, Sky Blue, Evergreen, and Vermilion.